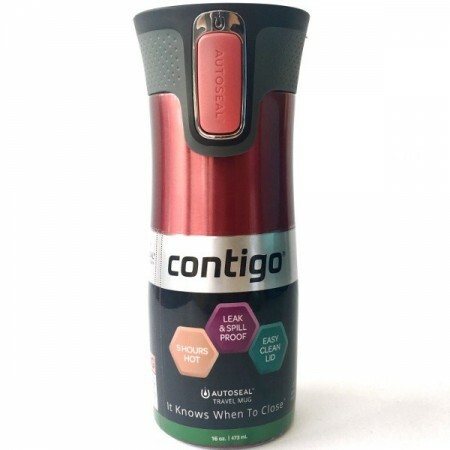 This Contigo travel mug is stainless steel vacuum insulated and is a travel friendly thermos perfect for active lifestyles. Simply push the button to open the Contigo Autoseal lid and release again to close. 100% spill & leak proof when closed. Will insulate hot for up to 5 hours and cold for up to 12 hours. 470ml. Buying this product = 48 Reward points for Members. Your cart will total 48 points = voucher of $2.40. Not a Member? Join at checkout to claim these points. Consuming less over time: Reusing a bottle instead of buying water in disposable plastic bottles is good news for the environment. It is estimated that 38 billion disposable water bottles that end up in landfills each year. Vacuum insulated stainless steel insulates warm drinks up to 4 hours, and cold drinks up to 12 hours. Easy one-handed operation, simply press the button to open and release the button to close. Contigo Autoseal lid will automatically seal between sips. Sturdy and contoured design makes it easy and comfortable to hold. 100% spill and leak proof when closed, properly maintained and properly assembled. BPA-free, will not leach harmful chemicals. Stainless steel is taste neutral and will not retain flavours. Wide-mouth fits ice cubes and makes cleaning easy. Lid is top rack dishwasher safe. Painted stainless steel should be handwashed ONLY. Allow to fully dry before storing. Do not put in freezer as liquid expands when frozen and may cause the bottle to crack. Rise lid straight after use, holding down the Autoseal button to allow water to run through mouthpiece. 'Push to clean' button inside lid allows a complete clean without having separate pieces that can get misplaced. 20cm x 6.5cm / 470ml capacity / stainless steel. My family have now purchased 5 of these as we like them so much! They are the only reusable insulated mugs we've found that don't leak, and can therefore be safely carried inside a bag without spillage. They keep drinks hot for a good 4-5 hours, and are pretty easy to clean. They correspond to a large/grande size cup in most cafes and we are usually offered between 50c - 70c discount per coffee for taking along reusable mugs, so have paid for themselves eventually. I use my Contigo Mug everyday. It never leaks and it keeps my hot tea piping hot for ages and my cold drinks cold for even longer. I'm frequently in my car for work so it's a perfect drink vessel for when you're on the move! Excellent travel mug - secure, no spills! I wish I hadn't waited so long to buy my Contigo mug. I ummed and aahed over the price, but seriously it's worth the investment. My Contigo mug travels with me everywhere - I love having a steaming hot tea in winter or icy cold tea in summer. Love it! And I never have to worry about it spilling unlike my last travel mug. 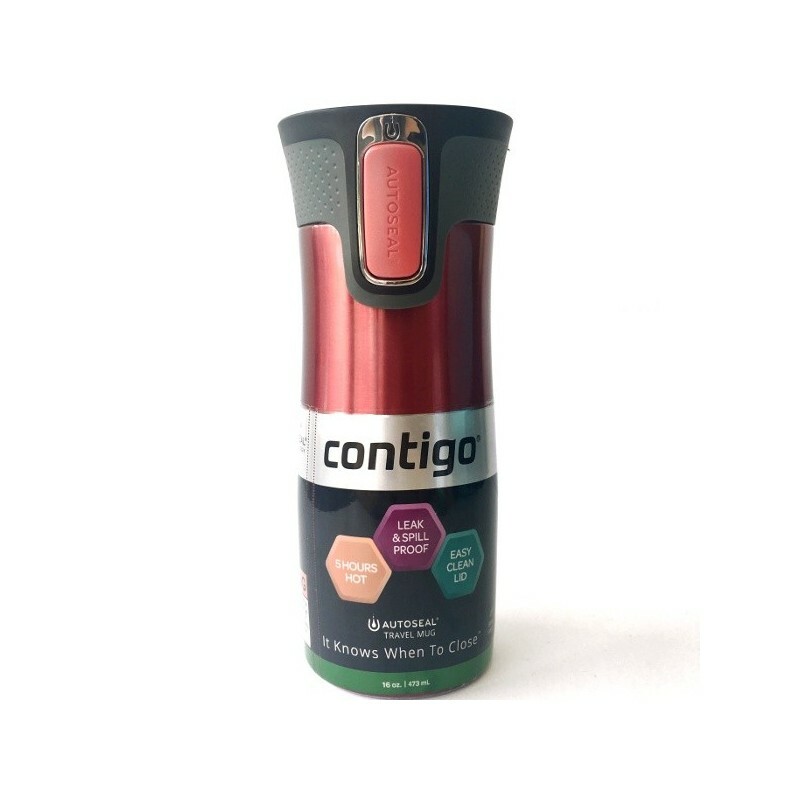 Contigo's lid sits well and the button to open is so cleverly designed.